The fun way to organize your brain. Unleash your creativity and achieve your goals. A unified design offers flexibility as well as simplicity. Like common task managers, Flowlist shows your focused items in the middle, an overview to the left and details to the right. 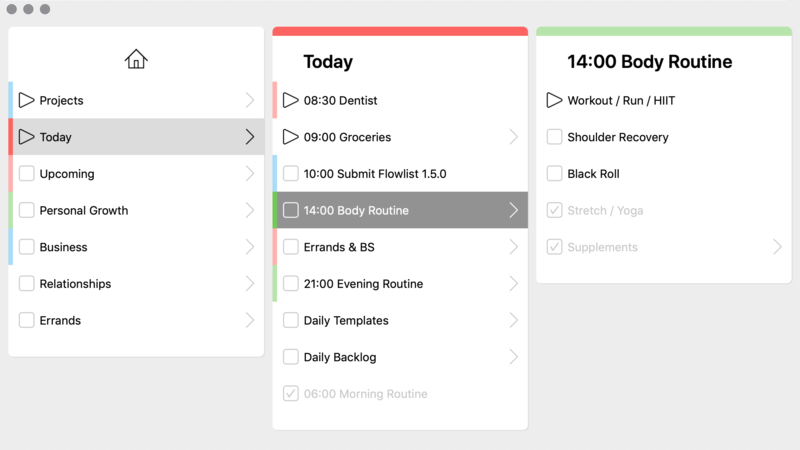 Unlike common task managers, Flowlist has no fixed categories like Project or Subtask. Instead, items contain items, and that's it. Build any item hierarchy you want. Focus on any list at any level. Press ← or → to slide context or details into focus. Focus on your ideas in a productive state of flow. Organize all your stuff however you want. There are no predefined categories like "Project". There are only items which may contain items. Group items together. Add subitems into any (empty) item. Move items between levels. Thinking and editing will become one. Items in a list are like paragraphs in a text. You also write, select and edit them similar to paragraphs or lines. It feels familiar and intuitive. Of course, there are practical additions, like adding an item to the top via Space, or moving it up and down via ⌘↑ and ⌘↓. With just a few intuitive key commands, you have all editing, navigation and features at your fingertips. Your hands never have to leave the keyboard in between typing. And the window can focus on presenting your content, instead of being cluttered with input elements. Empty items correspond to paragraphs, while items that contain other items correspond to headings. Via ⌘E, you can export lists at any level to a plain text or markdown file. Flowlist generates paragraphs, headings, sub-headings etc. Hit numbers 1 to 6 to toggle a color tag for the selected items. Or hit 0 to remove the current color. For example, make deadlines and meetings red or make meaningful productive items blue. Switch between Daylight- and Dark Mode via ⌘D at any time, independent of your macOS settings. Dark Mode is a cool looking dark color scheme which offers your eyes some rest and lets you sleep better, work at night and feel like a pro. Copy content from any document or website and paste it into one of your lists. Flowlist will detect the structure of that content and will paste it as distinct items (if the content is so structured). Via ⌘+ and ⌘-, you adjust the font size and thereby the zoom level of the whole UI. Work on a 12” laptop or lean back in front of a gamer screen. Also, when you resize the window, the UI will adapt and use all available screen space for your content. Prioritize (reorder) items at all levels. Quickly move to the most concrete next action step. Put items in progress, check them off, review what's done. In Monotasking mode Flowlist hides all other apps, the menu bar and the system dock. Fullscreen mode also helps to focus and looks pretty. All navigating and editing is animated, which makes it easy for your eyes to track where you are and how items change. It's also really fun. Select the features you want next. Voting takes 3 minutes on average. Get personal email support directly from the developer. I usually respond within hours. Manage 100 items forever and for free. Or unlock the full version from within the app. You'll get new features as free updates, even when the price rises. No paid upgrades. allow for rapid editing and a clean interface. Go up ↑ or down ↓ within the currently focused list. Focus details → or get an overview ←. Add an item to the top of the list Space or add ↵ and remove ⌫ items just like lines in a text. Move an item up ⌘↑ or down ⌘↓ to visually prioritize within the currently focused list. Extend the selection up ⇧↑ or down ⇧↓. Add/remove items to/from the selection ⌘Click. Start or pause an item's progress ⌘→. It will slide up or down to adjust its priority. Check or uncheck an item ⌘←. It will slide up or down accordingly. Selection will auto-adjust. Edit the first selected item ⌘↵. Then finish typing ↵. Group items together ↵ and enter a title. The initial group state reflects the grouped items. Focus an empty item → and add subitems into it ↵ or to the top of its subitem list Space. Duplicate items or move them into a different item via copy ⌘C, cut ⌘X and paste ⌘V. Paste the last deleted items ⌘Z in case you accidentally deleted items from the focused list. Copy content ⌘C from any document or web page and paste it as distinct items ⌘V into a list.